A drink-driver who tried to blame his actions on an imaginary friend has been disqualified for four years. Stephen Slark also received a suspended prison sentence after he was caught over the limit in Hove, Sussex Police said. At about 11.30pm on Saturday 23 December, plain clothed police spotted a man – later identified as Slark, 40, a scrap metal dealer, of Butts Road, Southwick – walking towards a commercial van in Goldstone Villas, close to Hove railway station. He was then seen to drive the vehicle a short distance before he stopped by the entrance to the Post Office, where he got out and met a female companion. He was approached by PCs Nick Simmons and Andy Newman, who identified themselves and questioned why he had stopped there. Here is their exchange, as reported by Sussex Police. SLARK: “John, he ran down there and jumped over the fence” [pointing to a fence at least 12ft high]. At this point, the plain clothed officers called for assistance and Slark was required to undergo a roadside breath test, which he failed. He was charged with driving with 58mcg of alcohol per 100ml of breath in his system and committing a further offence while subject to a suspended sentence. 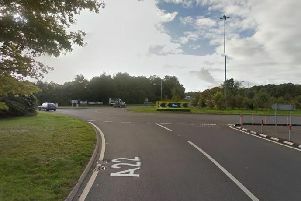 At Lewes Crown Court on 20 April, Slark was sentenced to three months in prison, suspended for 18 months, and disqualified from driving for four years. He was also ordered to pay £100 costs and a £115 victim surcharge. Slark was among 195 arrests made in Sussex during Surrey and Sussex Police’s Christmas crackdown on drink and drug-drivers, which ran from 1 December 2017 to 1 January 2018. Of these, a total of 129 have so far been convicted, and the remaining have been either charged, released under investigation or released without charge.